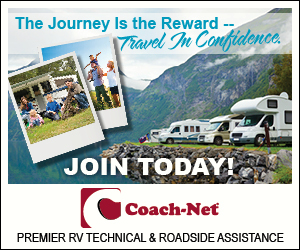 Many RV Parks take great pride in their lawns, grassy fields and other green spaces so they prefer that those of you who are using a generator to take precautions to prevent the hot exhaust from burning the grass. 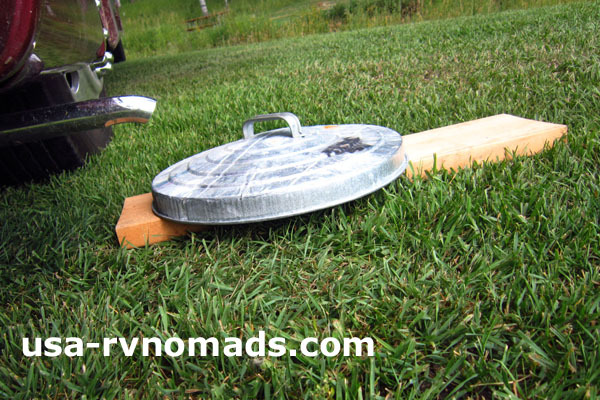 A simple way to prevent that is by creating a heat diffuser from a metal trash can lid. I have a metal five gallon trash can that I use outside of the RV. (It can double as a means to tote water or sand in case of an emergency. There used to be a requirement to have such a container and a shovel while camping in National Forest Service areas.) By using the lid, placed on top of either a board, rocks, bricks or wood…anything to insulate the metal lid from the grass, it will diffuse and act as a heat sink to keep the hot exhaust from damaging the grass. Its simple and effective and the items shown multitask which is something you want when trying to conserve space and weight.